Every business needs a unique name, image, and design that represents what it stands for, and what services it will provide to a consumer. This naming, designing, and giving a visual outlook to your business is known as branding. Branding helps the customer differentiate between your product/services from others in the market. Just like any other business; photography business needs a brand too because branding is just not finding unique names or fancy logos. It’s about connecting emotionally with your consumers. And when people go to photographers it’s because of some emotion they want to capture and memories to store. Hence, branding your business is like a rope for your success. A better brand makes people believe in your vision and dedication; and not take you as another person looking to kill time or chasing a dream that changes every week. Branding is a hard, time consuming and meticulous process and it needs focus, research, and patient. 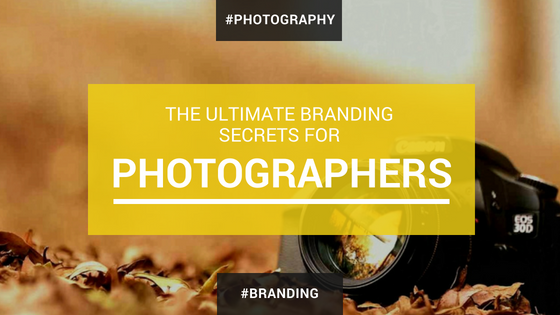 So here are some branding tips for you budding photographers. The logo is the face of your brand that will go on your business card and on billboards or newspapers if you ever feel like advertising. So, while finalizing a logo, keep all these things in your mind. A logo should be simple and elegant not fancy; it should be short, catchy but descriptive. It should be readable whether used in color or black and white. Also, most importantly it should be able to do justice to the type of photography you do. Research well on Google, look at successful brand before going in guns blazing at your own logo and coming out with something that just doesn’t work. For those, who don’t want to get themselves into DIY designing, can look for online photography logo maker tools. These tools are absolutely free and can help you create a decent logo within minutes. Although if you are looking for something expert level, investing a designer might be a wise idea. A photographer’s work speaks about his personality and that’s what you need to bring into your branding too. The overall feel of the branding should go with how you are as a person and what your work is all about and what it depicts. If your work is bold you can’t have a logo with pastel colors or typefaces. If you prefer clean and simple but elegance goes with a modest logo. Similarly, colors also affect your brand. Some colors don’t go together so research well before using any of them for your visualization. You can read here how colors can impact the overall message when it comes to logo designing. Breathe and take a moment to decide what is different about your style of photography. How are you artistically and creatively different from other photographers and then will all this mind, build your branding strategy with your unique selling points. Getting inspiration from other people’s work is fine but don’t go ripping off everything they did. Be original, consumers always look for the next thing and maybe your originality will give them that and you more clients. Hiring a professional designer or branding expert is money well spent. A professional will learn everything about your business and what it stands for and design accordingly. It will give a signature look to your brand that will be just perfect for you. But hiring professionals is good money so only invest in this if you are dedicated and sure about taking the next step. The importance of having exposure on social media cannot be exaggerated more. Everyone is on social media and it’s the right platform to promote your brand, impressing the minds of people with your work and keep up the clientele. Instagram and Facebook are a great social media platforms to make an online presence. Just post your pictures, tag the involved people and add your website or contact details, the right people will surely look you up. But digital marketing needs consistency, simplicity, and variety so don’t let your account go stagnant. Post regularly and mix it up. Like and follow the works of people and not just photographers you admire. Like their post, re-post their work and they will too hopefully give a shout out to your work. This will increase your audience as you have just been exposed to their entire followers. Branding is the need of the hour and once you have done it perfectly, you will be surprised with the results. But also remember no amount of branding, advertising makes up for poor work. So never let your work suffer. Your priority should always be photography and the quality you give to your customer. Never compromise with that.